Phyllis Lewkowicz couldn't be happier about welcoming new members to the family at Congregation Beit Kodesh in Livonia. Several months ago, she and members of the temple had formed a Save Our Synagogue committee. When Lewkowicz first came to the area in the 1950s, the synagogue didn't exist, but grew over the years until membership began dwindling. On Sunday, Nov. 6, members will celebrate the congregation's rebirth by dedicating the renovated sanctuary at noon. "This will be a special occasion," said Phyllis Lewkowicz, one of the visionaries who began holding Shabbat (Sabbath) services at Clarenceville Central Elementary School in 1958. "It's part of the entire plan to improve the sanctuary and building." Although Beit Kodesh still doesn't have a rabbi, they are welcoming Jason Miller who'll serve as a consultant to help them grow for the future. 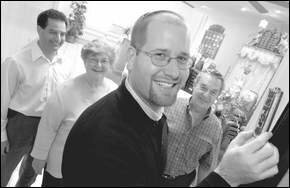 Rabbi Miller will speak about his position in the congregation and give the Shehechi'anu blessing of thanksgiving, present a new Kiddush cup used for wine sanctification during Shabbat and holiday services then affix three of the 15 Mezuzzah blessings to doorposts in the synagogue before sharing brunch with the congregation. Each of the Mezuzzah [sic] contains a parchment with the Shema prayer from the Torahthe books of Jewish scriptures. Jeff Kirsch originally sought the help of the United Synagogue of Conservative Judaism to connect with Rabbi Miller who will guide the congregation until they're able to have a full-time rabbi. Currently members like Kirsch lead the services. "We believe there's potential," said Jeff Kirsch, vice president of the religious committee and a Farmington Hills resident. "We've already seen very positive changes. Membership has gone up." "We're a viable organization," added congregation president Martin Diskin, a Farmington Hills resident. "I feel at home here. I've broadened my Jewish education over my 30-years with the synagogue." Rabbi Miller believes the congregation, which serves not only Livonia, but Farmington, Canton, Westland, Novi and Northville, will continue to grow because of offerings such as the Sunday school. The 29-year old rabbi feels there are many young families like his who are looking for a synagogue to meet their needs. Rabbi Miller has a 21-month-old son and his wife is expecting twins in the next 4- to 5-weeks. "Beit Kodesh is an amazing place. The people are a more dedicated community of Jewish people that I've ever seen," said Rabbi Jason Miller who by day works as assistant director of the University of Michigan Hillel, a program for Jewish college students in Ann Arbor. "In terms of geography they're situated in an area with many young Jewish families who are unaffiliated and looking for a community just like this. They're going to need the religious education." Along with educating youth in the Jewish faith another plus for new members is sure to be the congregation's acceptance of interfaith marriages. "Beit Kodesh is committed to reaching out to those families and bringing them in," said Rabbi Miller. There a lot of Jewish families in this area not being reached. We're proud of who we are, a conservative congregation with people in times of grief, in times of joy. That's what people are looking for in today's age." To RSVP for the sanctuary rededication and brunch with the rabbi, call (248) 477-8974. The cost for the brunch is $5, no charge for children age 12 and under. Congregation Beit Kodesh is located at 31840 West Seven Mile, between Farmington and Merriman roads, Livonia. For more information, visit the Web site at www.beitkodesh.org.